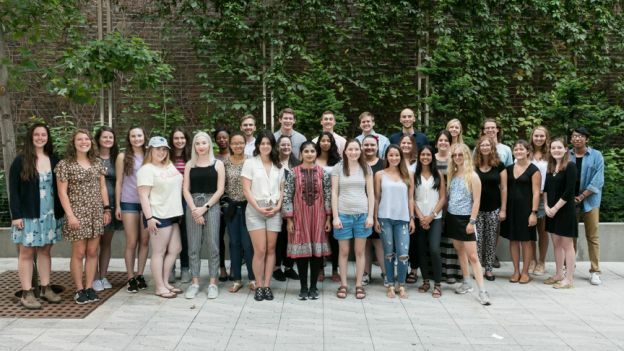 Young Ambassadors are undergraduate students and Master's students from North America that recently studied abroad in Germany and promote study in Germany at their home universities with help from the DAAD. They help to inspire their fellow students by giving them useful tips on how to enjoy and make use of their own stay in Germany. The DAAD Young Ambassadors Program is a unique and exciting two-semester volunteer opportunity for undergraduate students and Master's students to promote study and research abroad in Germany at their home universities and colleges. The program starts with a mandatory, three-day training session in New York City which usually takes place in August. DAAD covers the costs of round trip transportation for Young Ambassadors from their North American home universities to New York and provides accommodation and meals for the duration of the workshop. The objective of the workshop is for participants to acquire the knowledge and skills needed to effectively promote study and research in Germany on their campuses. Students learn about the German higher education and research system as well as the wide range of DAAD funding opportunities. In addition, the training focuses on refining public speaking and presentation skills and meeting new people. During the academic year, DAAD Young Ambassadors promote study and research in Germany by working with their universities' study abroad offices, volunteering at study abroad fairs, organizing classroom visits, info sessions, fun events, and answering their fellow students’ questions. DAAD provides Young Ambassadors with brochures, giveaways, and funding for events. Along with this, a profile including contact information for each Young Ambassador is featured on the DAAD USA website. DAAD Young Ambassadors are required to submit at least three event reports during the academic year. While the DAAD Young Ambassadors Program is a volunteer opportunity, all event reports are included in a raffle drawing at the end of the academic year; prizes ranging from $20 to $200 awarded in recognition of the volunteer’s time and commitment. Young Ambassadors do not necessarily have to be alumni of DAAD grant programs. We will give special attention to nominations from study abroad offices, but will also accept applications directly from students who wish to apply on their own and provide contact information for a reference. Note: Application forms for 2019/20 are available for download in the box on the right. The Young Ambassadors Program is great for helping returning study abroad students put their newfound knowledge and experience to good use. Take the opportunity to nominate a DAAD Young Ambassador on your campus! Please see above for the requirements that students need to fulfill in order to be eligible for the DAAD Young Ambassadors Program. Although students may apply directly to DAAD to become a Young Ambassador, special preference will be given to candidates nominated by their university's study abroad office or by a professor. Please keep in mind that only one student can be nominated per college or university. If you choose to nominate a Young Ambassador, please fill out the nomination form (last page of the application form) and submit the completed application form to DAAD New York. Please do not forget to attach the nomination letter as requested in the nomination form. Please submit your nomination together with the student’s application in duplicate: one original hard copy and one electronic (PDF/Word) document. Click here for the current Young Ambassador profiles and an interactive map to locate a Young Ambassador near you.